ICOM students spend their third and fourth years doing clinical clerkship rotations at core affiliated hospital and outpatient sites. These clinical rotations utilize both traditional and innovative educational options, including regularly-scheduled learning sessions, interactive computer based learning, simulation, with assessment of clinical knowledge and skills. All clinical rotations are with contracted, accredited physicians at clinical sites that offer significant diversity and numbers of patients to allow for excellent educational environments. Clinical rotations occur in a variety of settings, including hospitals (inpatient experiences), ambulatory practices, and long-term care facilities. Core hospital assignments will take place in the fall of the second year with significant efforts to place students at their core sites of choice. Each core site will have a Regional Dean and Coordinator to facilitate a strong educational experience. ICOM will continue to engage hospitals, clinics and physicians to offer new diverse training opportunities. Hands-on learning in osteopathic manipulative medicine will continue in student’s third and fourth years. Core and affiliated rotation sites are subject to change and ICOM cannot guarantee any specific site or state. 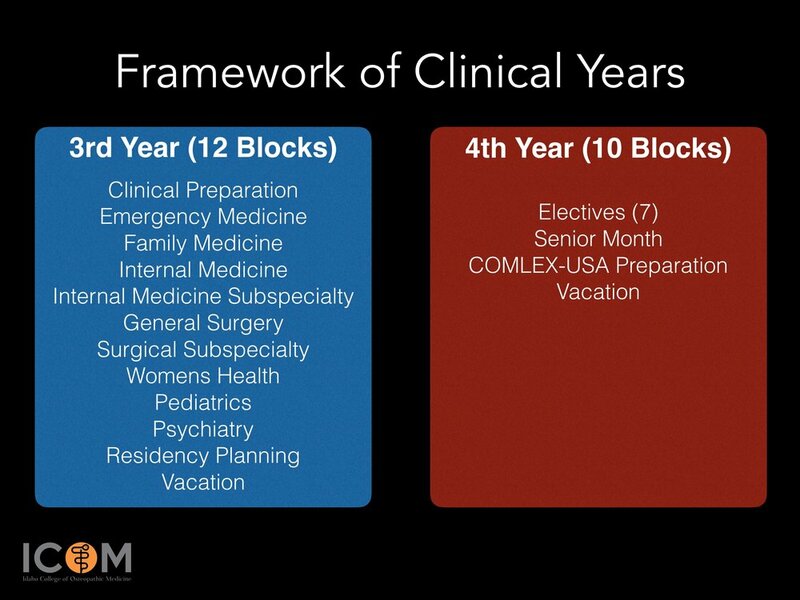 The goals of clinical clerkship rotations are based on the American Osteopathic Association’s (AOA) seven core competencies, as well as the thirteen Entrustable Professional Activities (EPA’s) per the American Association of Colleges of Osteopathic Medicine (AACOM). The ICOM Office of Clinical Affairs will assist and educate students is scheduling their clinical rotations. All physicians preceptors will be board-certified/board eligible and be credentialed and contracted with ICOM. ICOM’s third- and fourth-year curriculum delivery occurs through the regional sites located in the states of Idaho, Montana, Wyoming, North and South Dakota and beyond. In the second year of the curriculum, students will be designated to a regional site. Regional site placement procedures are designed to support the mission of ICOM to recruit students to meet the health care workforce needs of the rural and medically underserved areas that we serve. The associate dean of clinical education has the authority to assign a student to a rotation site and/or a regional site. Students will complete appropriate paperwork, (signed contracts) and the official list will be posted by Student Affairs. At the end of this period, the site selection process will be considered complete. Any appeal based on documented extenuating circumstances must be submitted in writing to the associate dean of clinical education for consideration. Changes will be processed by Clinical Education. ICOM’s third-year osteopathic medical students will be required to complete 12 core rotations. The required rotations for third year are listed below; all core rotations must be taken and completed at ICOM core rotation sites. Core rotations are clinical rotations involving patient care which are required to be completed at a ICOM affiliated clinical site with ICOM faculty. subspecialty, woman's health, pediatrics, behavioral health, emergency medicine, surgery and surgery-subspecialty. All third year students will complete clinical preparations, a four-week course at the beginning of their third year, to prepare them for clerkships. Third-year students also must complete a four-week scholarly activity rotation. All third-year rotations must be successfully completed to progress to the fourth year. Third-year students receive four weeks of vacation in the academic year. The internal medicine subspecialties include allergy/immunology, cardiology, critical care medicine, endocrinology, gastroenterology, geriatric medicine, hematology/oncology, infectious disease, pulmonology, nephrology, neurology, and rheumatology. The surgical subspecialties include orthopedic surgery, cardiovascular surgery, urological surgery, otolaryngological surgery, anesthesiology, dermatology, neurosurgery, pediatric surgery, plastic and reconstructive surgery, and vascular surgery. The fourth year will consist of seven elective rotations, typically four weeks in length, to allow adequate time for audition rotations and to strengthen students clinical skills and knowledge in their favored specialty. Two required rotations in the fourth year assist students in readiness for COMLEX-USA level 2 and preparedness for residency.